Hey y’all! Over the past few months a lot has happened in my corner of the world, and I’ve also accumulated a couple photos. You all know what that means! :) It’s time for another “Currently” post! So glad to finally check this off my bucket list! Back in June, I was able to go hiking with one of my older brothers early one morning. This is an edited photo of the gorgeous mountain we climbed (although the photo does NOT do it justice in any way, shape, or form). We did not hike all the way to the top since we were limited on time, but we hope to in the future, especially since I have never been to the top before and it boasts a spectacular view. I also apparently felt the need to get this weird, pointless photo on a rock amidst a stream along the trail. And then there is volleyball! Now, let me tell you about this. Last year was a sort of gap year for me in volleyball. I played with the YMCA to keep up with the sport, but very little of it was actually REAL volleyball. Coming into this year, we researched tryouts and local teams early on so we had time to weigh options before tryouts began. The only team we ended up acknowledging as a possibility though happened to be located 45+ minutes away. With my threatening full schedule, and this being such a distance, we were skeptical. I faced the reality of once again not having a real team in 2018. Just a couple weeks before tryouts began for most of the teams in the area, my mom received some information about a new team starting up. And guess what? They were only about 20 minutes away from our house, AND the facility is located on the same highway as the college I will be taking classes at. Talk about convenient! Isn’t God so good? He arranged everything so perfectly. I wanted to play volleyball this year so badly, and He worked out every single detail. It blows me away that such a great God would care so much for me to fulfill such an insignificant desire of mine. It’s always exciting when there are expecting mamas in your circles! I have a weakness for reverting back to special papers + stickers when it comes baby cards… these were super fun to make! I haven’t done much lettering lately, but I managed to get these two in. Please forgive the dingy color of my lettering notebook. I was very excited to get new blog photos taken recently for my about page and profile photo. My sister did the photos for me and she did fantastic! Above are a couple from our little photo shoot. Which are your favorites? Well, that’s just a little snippet of what’s been going on in my life lately! Please comment and let me know what’s been going on in YOUR life lately. I’d love to hear! I loved reading this post!! It sounds like you've had a very adventurous and fun summer! :) First, that is so awesome you got to go on the hike! I went on my first hike with my sister in May. It was so fun! :) Your sister did such a wonderful job with your photos!! I especially love photos #6, #8, and #9! What camera did she use? 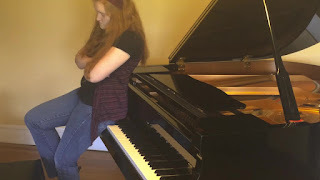 You are so talented at piano! I loved watching the video! The end made me laugh! xD LOL! Here's what's been going on in my life lately: a trip to the beach--on this trip I was able to take lots of pictures of a sunrise at the beach, starting school for the year, Bible Bee, and writing! My sister just used my mom's iPhone 6?? 8?? I'm not exactly sure what iPhone she has, but it has fantastic outdoor photograph quality. That all sounds awesome! I would love to go to the beach sometime soon. How is Bible Bee going?